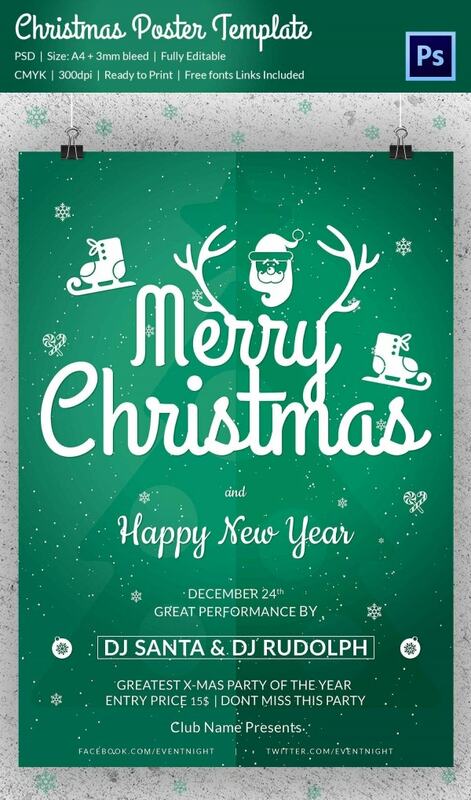 Christmas is one of the most celebrated festivals around the world. 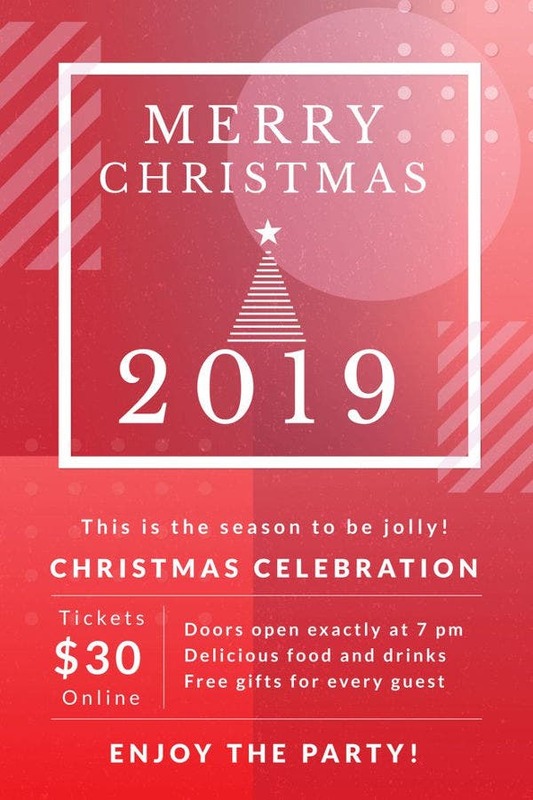 The festive season often calls for events, parties, get-togethers, and church and community services where it is necessary to intimate, communicate and broadcast to a large group of people about the upcoming activities. 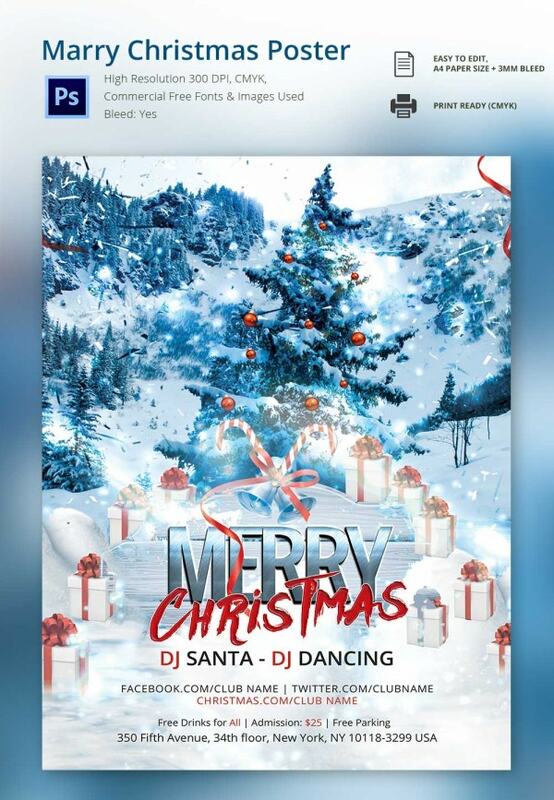 The Christmas Poster templates are a great way to create professionally designed Christmas posters in the convenience of your workstation without having to hire a professional to create a similar document for you. 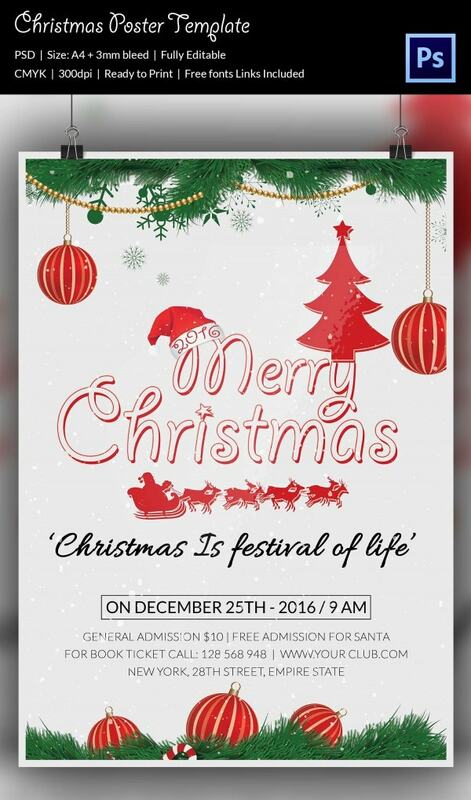 Christmas is truly the festival of Life and in order to create an attractive Christmas poster, you no longer require beginning from scratch. Simply download this editable template and customize it to make it your own. 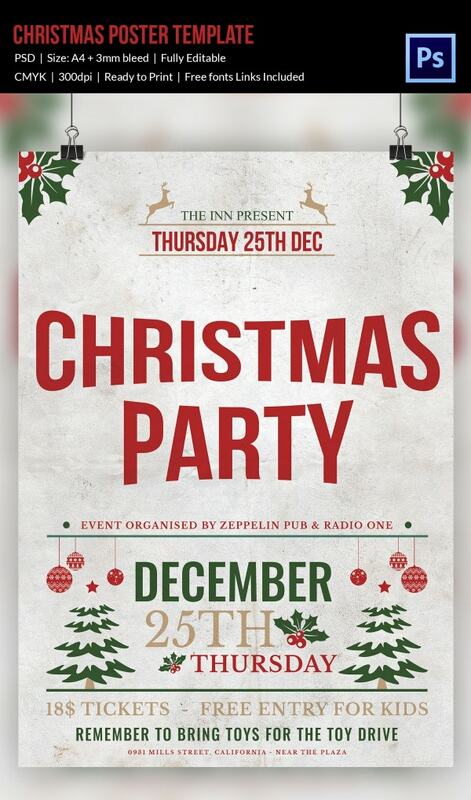 The biggest advantage of using posters is that they can be put just about anywhere and seen by almost anyone and therefore, this ready to print cool Poster can be an ideal solution to your marketing and designing woes about the upcoming Christmas party you have planned. 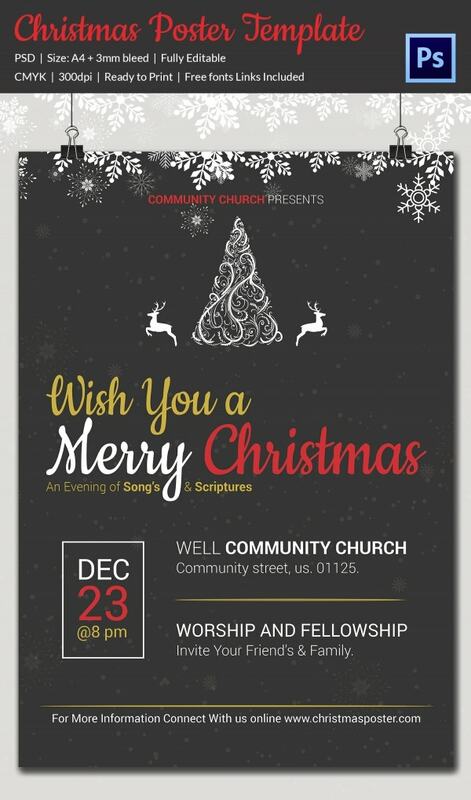 Posters are cheaper than common forms of advertising and downloading and customizing the Christmas Poster template can serve the purpose of creating customized and printable posters for community and church events. 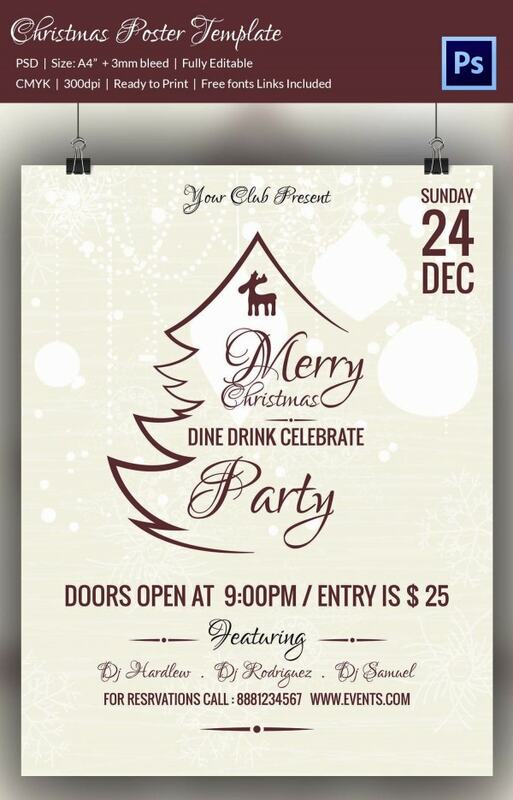 You can increase your Brand visibility in leaps and bounds for the upcoming Christmas Party using this A4 size PSD Christmas Poster template in black and white which is fully editable and comes in three color variants. 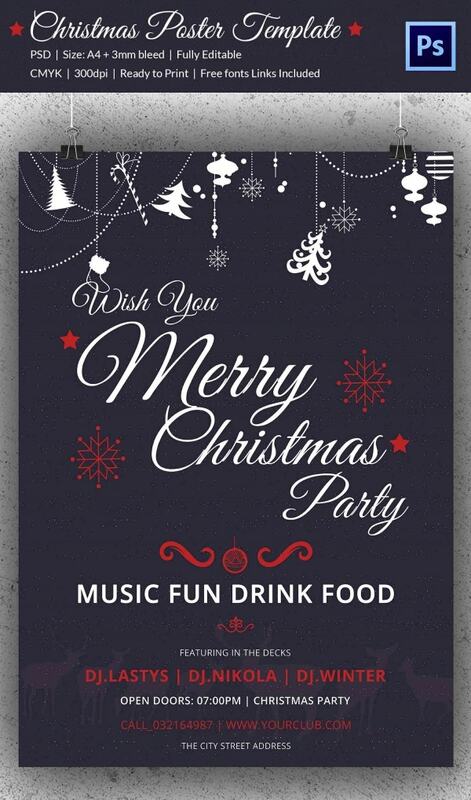 The combination of textual and graphic elements on this fully editable PSD Christmas poster with free font links makes it easy to create a stunning visual for the party lovers and peeps. 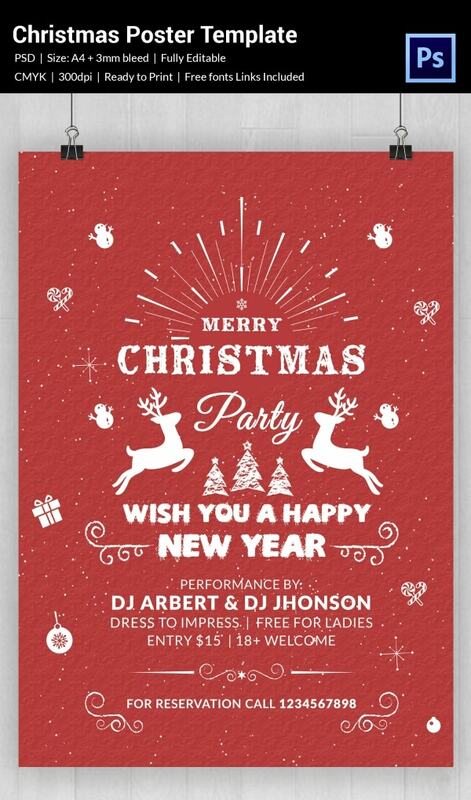 This poster template in festive red on a soft background speaks volumes about the Christmas cheer in the air. So if you are looking to create an eye catching and elegant poster to grab a lot of attention, this is the one to customize! 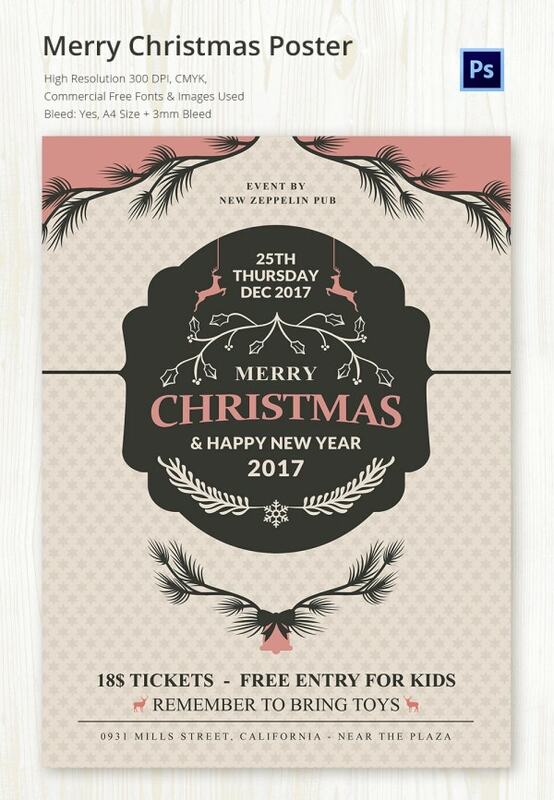 Posters provide a logical and cost-effective way of communicating to a particular target market and you can stand out by downloading and customizing this incredibly designed Christmas poster template. 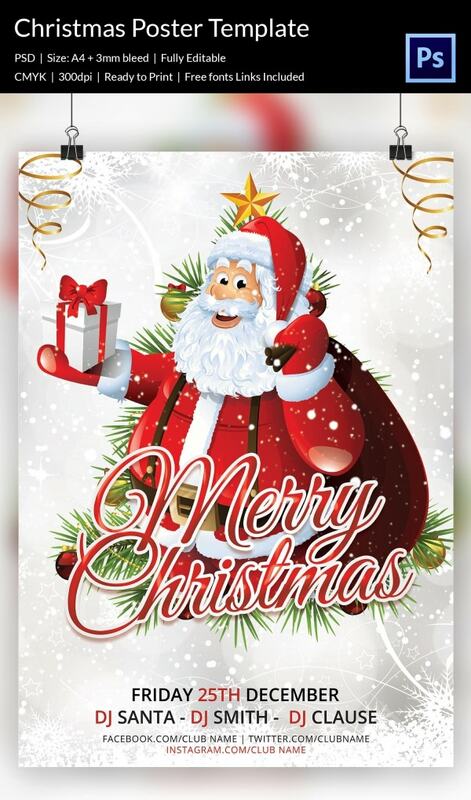 You can use this Christmas poster template to send Christmas cheer to your near and dear ones as well as create amazing visuals to attract attention for an upcoming Christmas party. 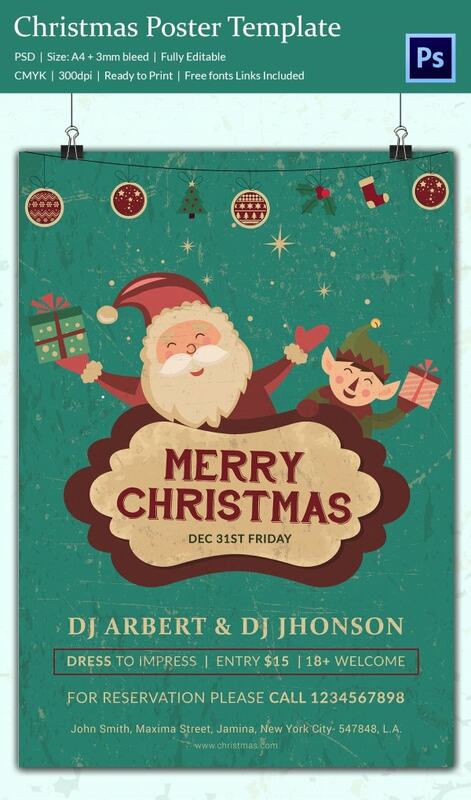 The creative process of a poster involves a copywriter and a graphic designer; however, with this Christmas poster template, you can yourself create a professionally designed poster for the upcoming festive events. 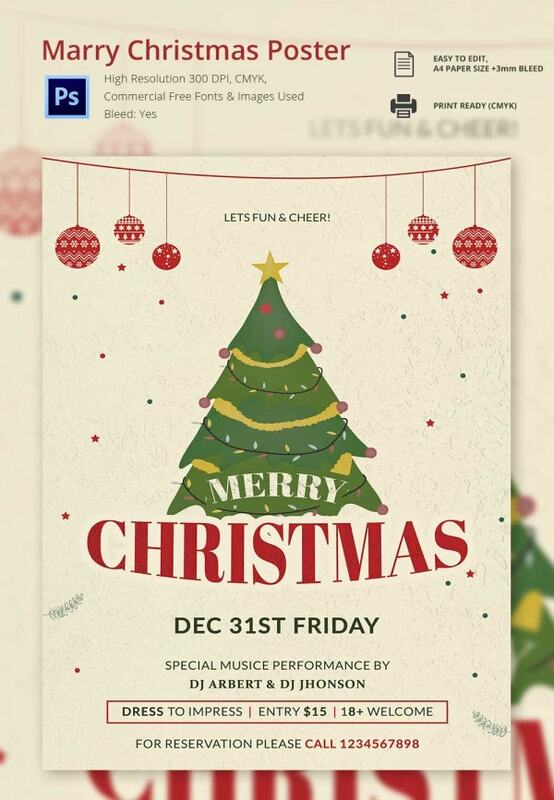 This chic and neatly designed PSD Christmas poster template features the festive colors and comes in an 8inch x 11inch dimensions in a ready to print format and includes free font links. 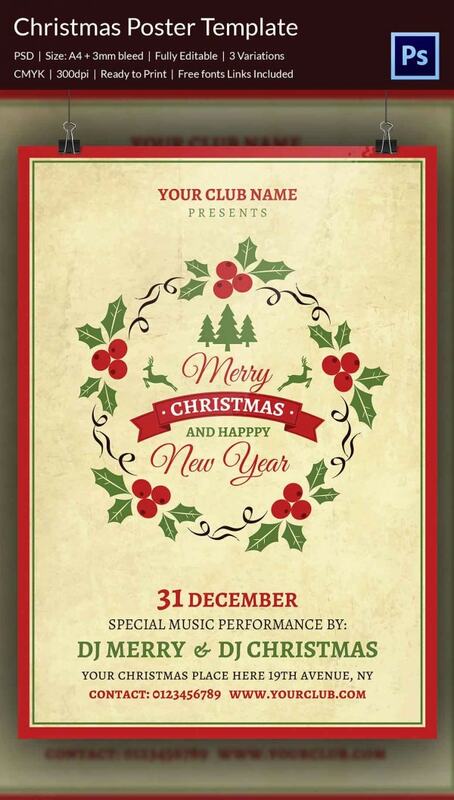 > How to use the Christmas Poster Template? Posters can serve as a great tool for advertising and marketing for small and medium-sized businesses. 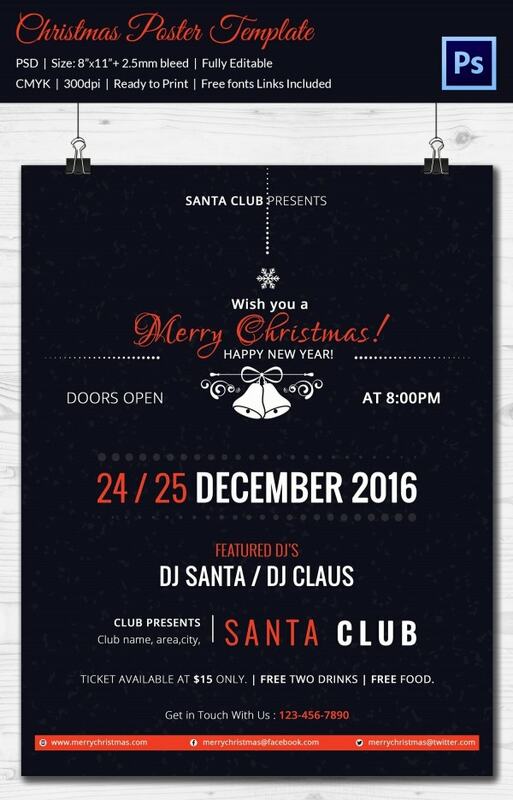 The A4 sized PSD Christmas poster templates are a bunch of professionally created pre-designed, fully editable, and ready to print documents which come in a PSD format and sometimes are also available in various color formats. 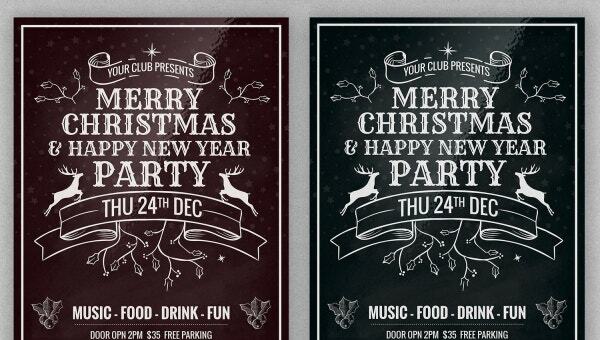 These posters have free font links included and save you the hassle of creating a poster from scratch. 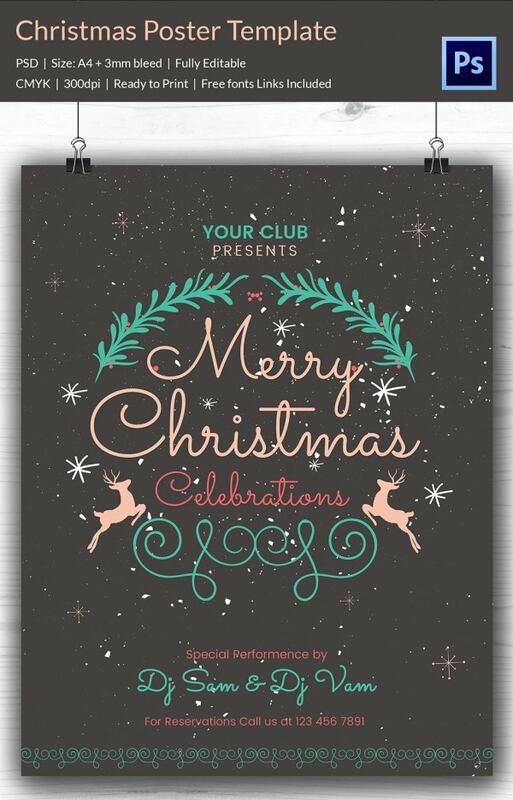 You can download the Christmas posters and customize them to suit your needs and purposes. 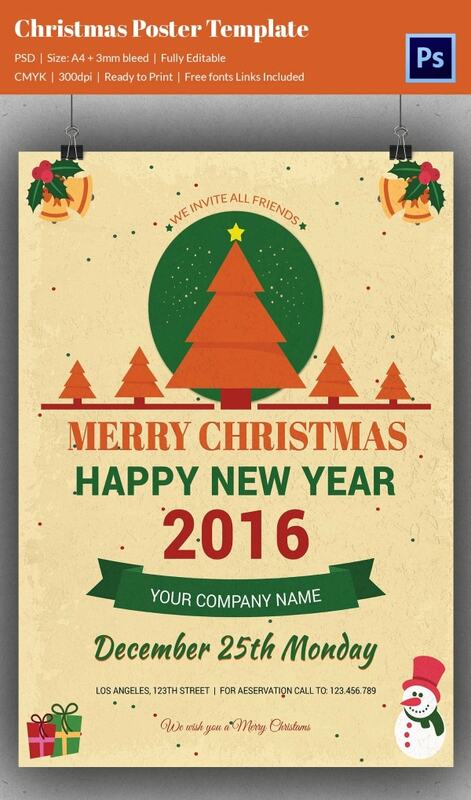 You have personalized templates for parties, events, get-togethers as well as church and community services. 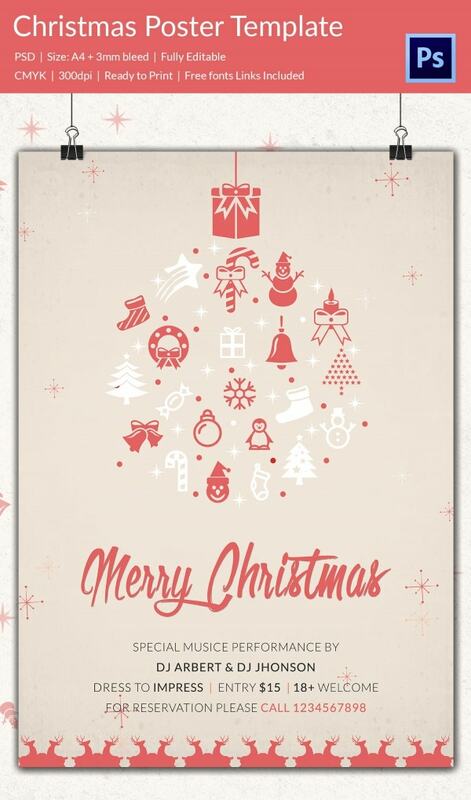 You can also see Christmas Greeting Cards. 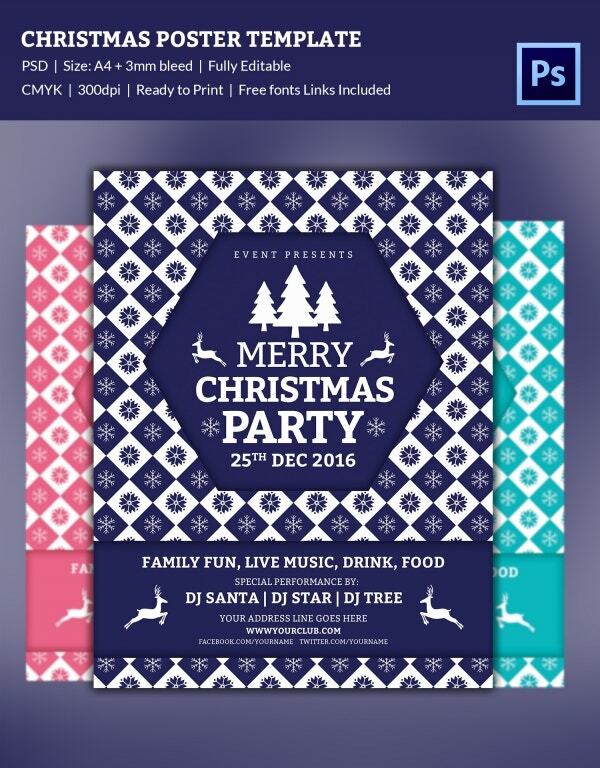 Christmas is the time when numerous enterprises render events, activities and discounts to attract a large business and creating posters is still one of the cheapest and effective ways of marketing. 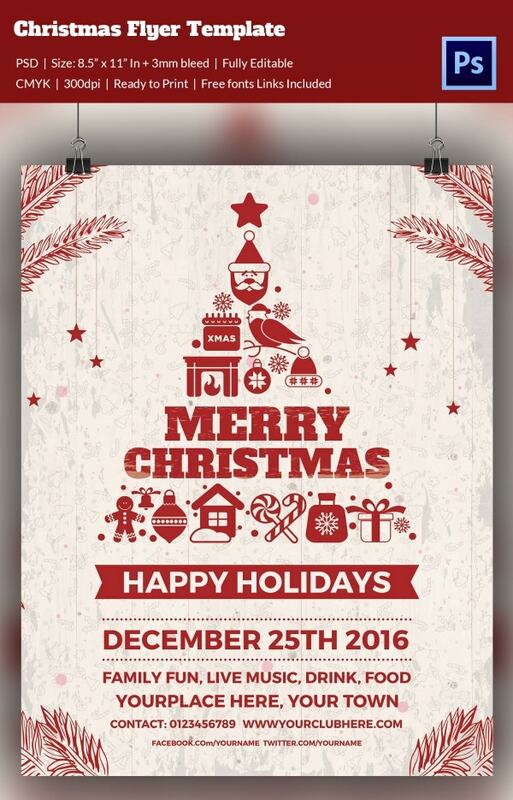 With the predesigned christmas templates available at Template.net, you can create stunning visuals to take your business several notches higher during the festive season.